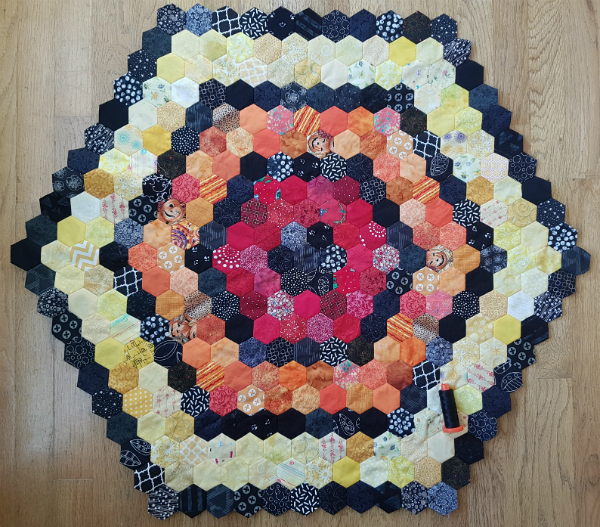 I've been enjoying a lot of hand stitching lately and now my Hexie Rainbow quilt has a round of black outside the yellow. Here it is again with a spool of Aurifil thread for scale 😊 It measures 31.5" wide x 35" high at this stage and will eventually be 60" x 70". 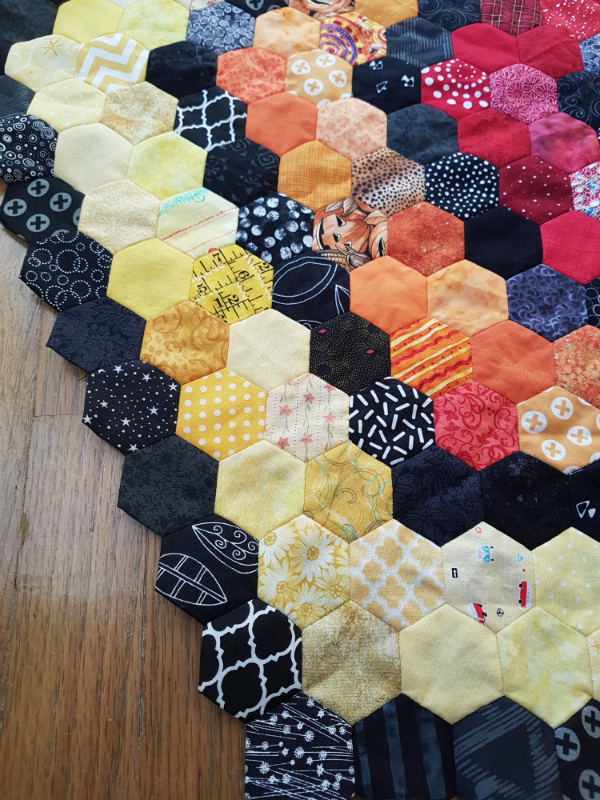 Lots more hexies to go, lol! I love that you can start to get an idea of the rainbow developing now that there are three colours finished. 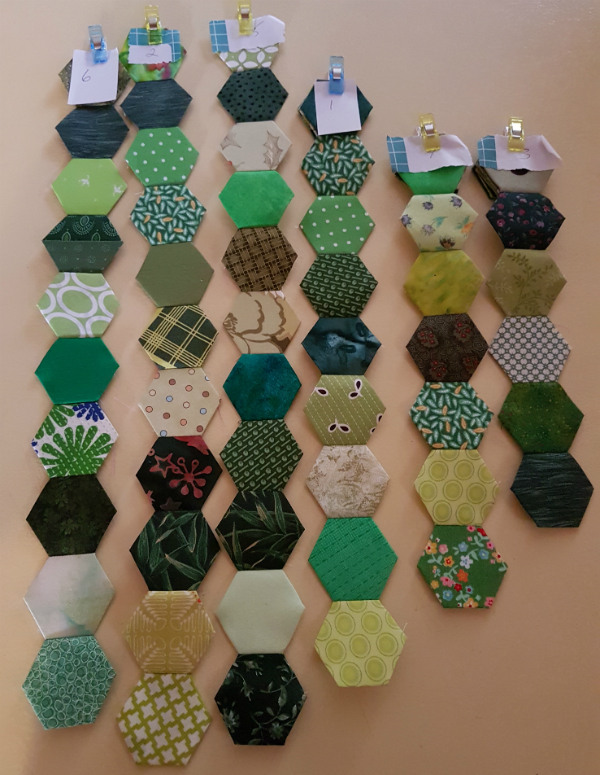 I've started joining green hexies together to create the sides for the first round of green. It's so fun to revisit fabrics from so many different projects and from a couple of different swaps and winnings. 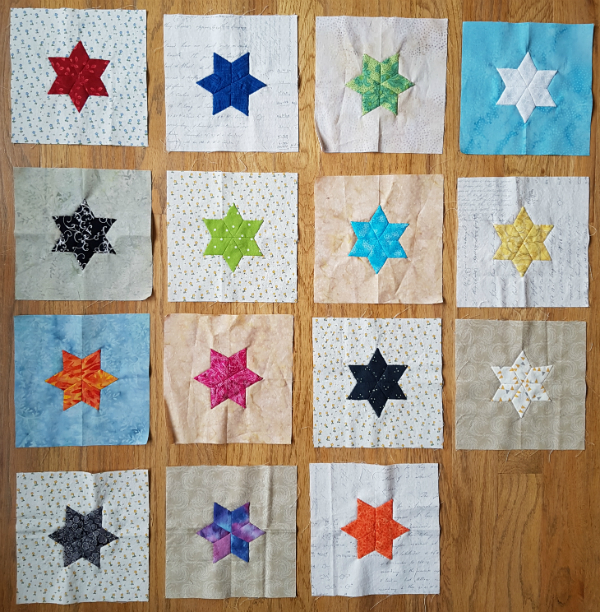 The three strips on the left are as long as they need to be and the numbers clipped to the top are so I know which order to sew them onto the quilt top. 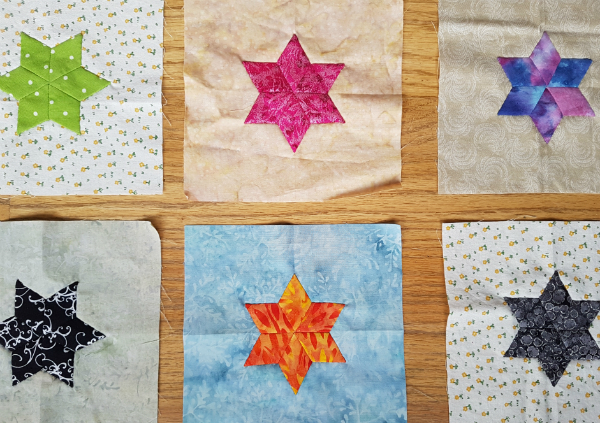 I've also been working on stitching my EPP stars to their backgrounds. I now have 15 finished! I really like the addition of the blue backgrounds and I plan to incorporate some medium value fabrics in other colours too. I love how the finished squares look when stacked up. The extra layers in the middle sure make a difference! Unfortunately, I've been doing so much hand stitching that I've aggravated my right wrist 😢 I've been sleeping with my brace on the last few nights, which helps, but I still have to take a break from the EPP and ladder stitch for a while to allow it to get all the way better. 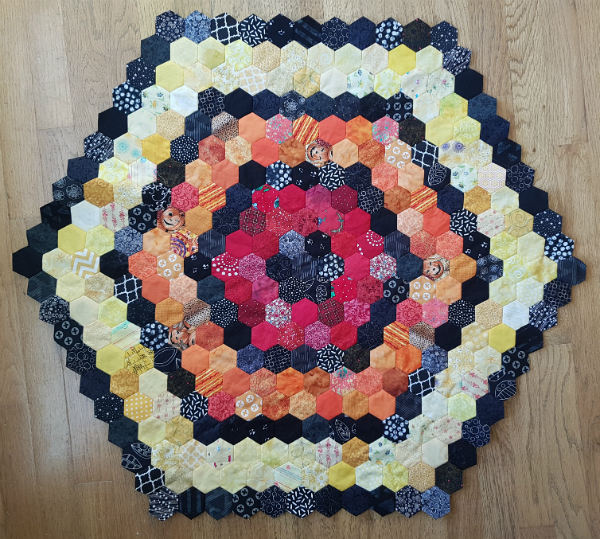 I'll still be basting hexies for the 100 hexies 100 days challenge, though. We're now on day 72 and this is what my case of hexies looks like. 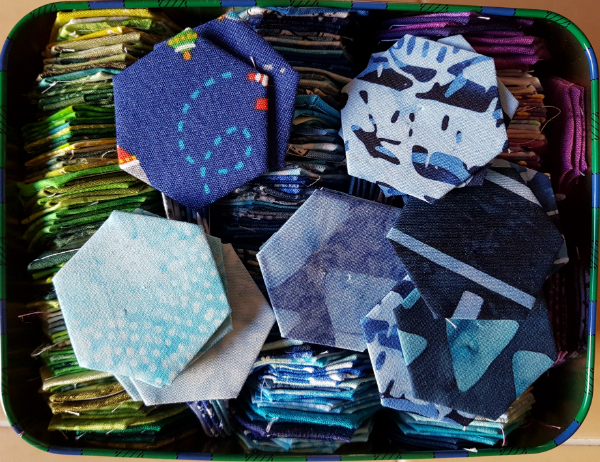 I've had to move the black ones to their own bag and I'm still having trouble fitting the green, blue and purple in the container, which is why the most recent blue ones are just laying on top. 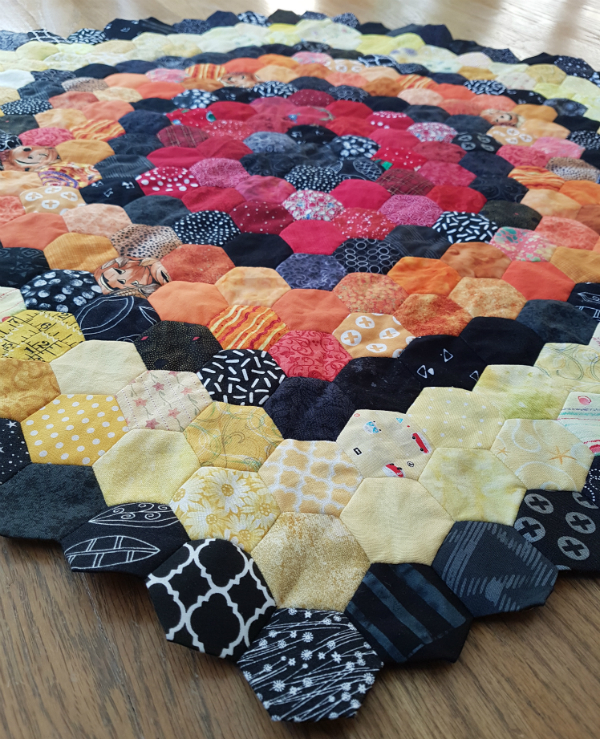 This challenge has been a big help in getting the hexies basted for my hexie rainbow. This looks like quite a bit of work Leanne but I am sure it will be worth it in the end. It's already quite large. Great progress, and I hope your wrist heals and feels better quickly. 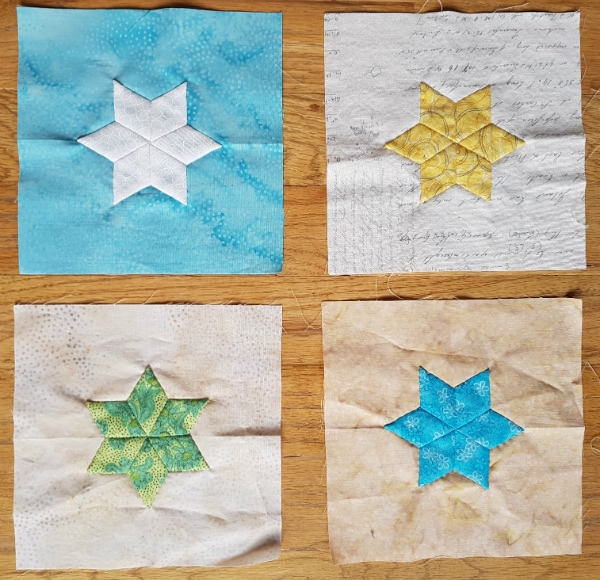 The basting challenge looks perfectly timed to set you up for the rainbow hexie project! The dangers of a quilter...I do hope your wrist feels better soon. 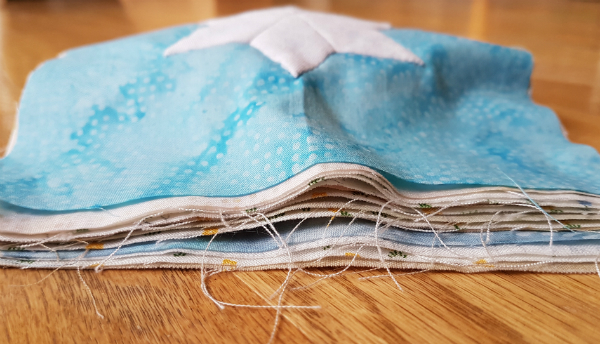 Sometimes with seam ripping and I imagine with EPP we hold our wrists at the strangest angles. 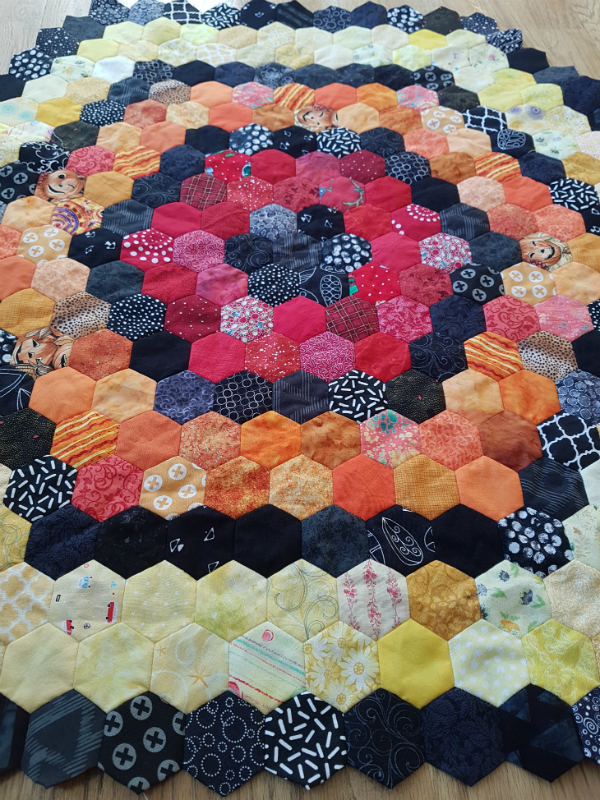 Quilts like your hexie quilt are one of my favorites. You can spend hours just looking at all the different prints that go into them. It looks amazing. Wow. And the EPP stars look great as well. Take it easy so you can get back to sewing.